Over the years, I’ve refined my baking repertoire. And while I love trying out new recipes, there’s a handful of core favourites that I routinely revert to. Our chocolate slab cake – one of the most popular recipes on our blog – is baked at least once a month. It’s a very large cake, and the neighbours all respond to the clarion call with plates to ferry their portions home (it’s that kind of cake). The butterscotch bars are almost embarrassingly easy to make, and they’ve become our regular standby for school orchestra rehearsals, last minute morning teas, and birthday and Christmas gifts. The white chocolate bundt cake in the photo above is Big Boy’s all time favourite cake. It’s a bit more work to make and probably only gets an airing three or four times a year, but this is the cake I turn to whenever I need a showstopper. And even though I’m not a white chocolate fan, in this cake, it’s sublime. I posted the recipe over a year ago, but have just updated it with metric measurements, since I make it by weight rather than cup measures these days. I always top the cake with tempered chocolate (in this case, milk and dark), but it’s almost as good simply dusted with icing sugar. Please note that it’s a large cake – the standard 10 cup bundt tins by Wilton and Nordicware will take most, but not all of the mix, so do have some muffin pans or mini tins on standby for the excess batter. The methodology, with updated measurements and a printable version, is available here. I’ve also made a caramelised white chocolate version, which was particularly wicked! I’d love to know your baking standbys – do you have a recipe which you turn to time after time? Our chocolate supplies are always fairly robust, but at Easter time, the situation gets a little out of control. And with the exception of what the rabbit brings, most of the chocolate we eat is tempered and moulded at home. Consequently, there’s often a surfeit of packaged Easter eggs and bunnies that the boys have received as gifts. This year we had a glut of Haigh’s solid eggs – way too good to waste, but far more than we could eat. Last night I decided to unwrap the whole lot – all 580g of them – and bake them into a large bar. I made a double batch of our butterscotch bar recipe (recently updated with metric measurements), substituting whole solid eggs for the chocolate chips (note: add the flour first, then the eggs, rather than the whole lot at once). The batter was baked in a lined 23cm x 33cm (9″ x 13″) baking tin for about 40 minutes, and then allowed to cool completely before slicing (to allow the melted orbs to reform). It’s proven to be a great way to share the love – you can’t give away eggs after Easter, but everyone adores a chocolate blondie filled with huge balls of chocolate! I’ve been baking for the school orchestra. They have rehearsals at this time every year, and it’s become a tradition to send in afternoon tea for them. I usually make butterscotch bars, but this year I thought I’d try something different. Nick Malgieri’s Supernatural Brownies (pictured above) are very easy to make, and perfect for feeding a crowd. The two batches I made cut into over ninety 2½cm x 5cm (1″ x 2″) bars. I tweaked the methodology a little to simplify it even further. 2. In a large pyrex bowl, microwave the butter and chocolate in short bursts on high until the chocolate begins to melt, then stir until smooth. Set aside to cool slightly. 3. In a large mixing bowl, whisk the eggs well, then add the sugar, brown sugar, salt and vanilla, whisking to combine. Using a spatula, stir in the chocolate and butter mixture, then fold in the flour. Pour the batter into the prepared pan and smooth over the top (the batter will be runny). 4. 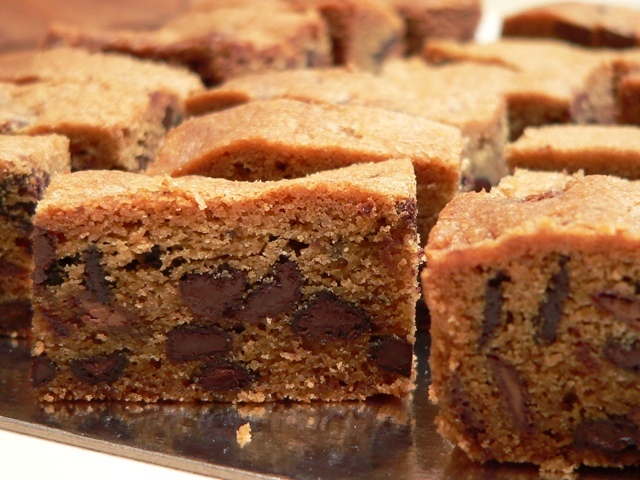 Bake until a toothpick inserted into the centre of the brownies comes out clean, about 30 – 35 minutes. Allow to cool in the pan on a wire rack. 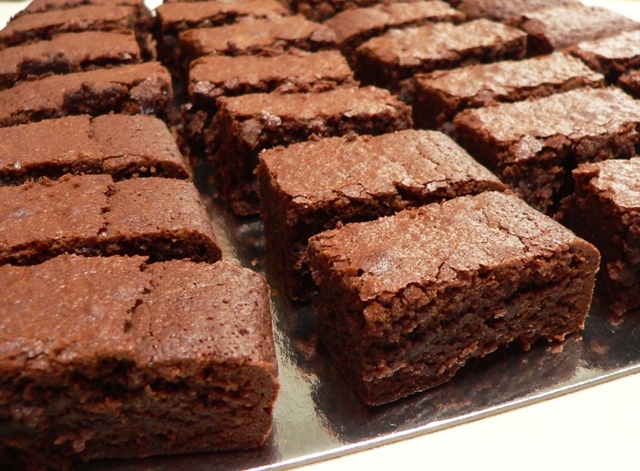 This recipe makes 24 x 5cm/2″ square brownies, although I cut the slab into 48 smaller pieces. Of course, I had to make butterscotch bars as well. The brass players would be very disappointed otherwise. All up, we’re sending in nearly 180 brownies and bars with Big Boy today!